Reserve Your Valois SSD-90 Knife Belt By Clicking Here Now! It’s much more durable than many of the light weight knives I have bought, and the belt is really comfortable. I wear this every day now. Great knife. I use it all the time. And the belt is very comfortable. I don’t use it for self defense so much as a utility knife. I am a flooring contractor and am constantly needing to open boxes and cut plastic. This is the fastest and easiest knife I’ve ever had. LOVE this! The blade is great! I tried to cut the belt a little on the inside just to see how it would wear out, and it was much tougher than I gave it credit for. I carry a holster with a Browning 1910, a large flashlight, and larger knife on the belt and it all still stays tight and sits well. If you have any issues or are dissatisfied in any way with the Valois SSD-90 Knife Belt, we’ll exchange it, replace it or refund your money within 365 days of purchase. Simply email us about the problem at Chris@SelfRely.com, and we’ll take care of the problem right away. YES! 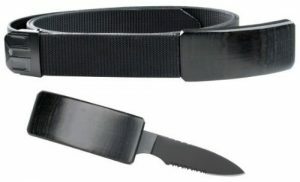 Reserve My FREE Valois SSD-90 Tactical Knife Belt Now!